Kenzo and Vans have collaborated for the first time: from May to July, three capsule collections of Vans shoes will be available. First up is the Era skate shoe, revisited by Kenzo’s designers in seven different colours, and available mid-May in both men's and women's models, with prices starting at 90 euros. 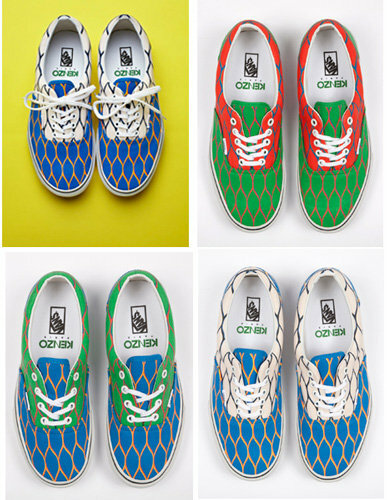 “We grew up in the suburbs of Los Angeles and we’ve been fans of Vans since we were very young: we have so many pairs of their shoes that it would be impossible to count them”, explained Humberto Leon and Carol Lim, Artistic Directors of Kenzo since July 2011 and also founders of the American label Opening Ceremony. The three collections will be on sale in Kenzo’s boutiques, on Vans’s website and at a selection of retailers such as Colette, Harvey Nichols, Bosco Milan and Lane Crawford.